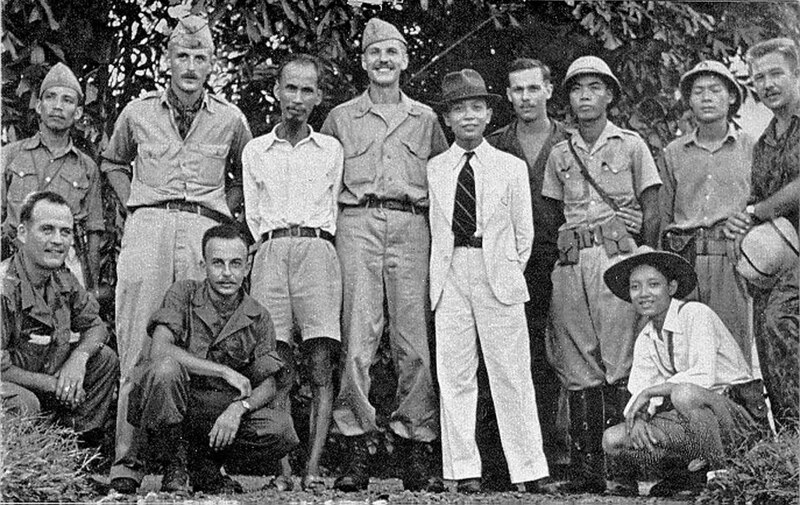 Hồ Chí Minh (fifth from left, standing) with the OSS in 1945. By early September 1945, Viet Minh forces had defeated the combined Japanese-French colonialists, and on September 2, before hundreds of thousands of people in Hanoi, Ho Chi Minh proclaimed the independence of the Democratic Republic of Vietnam (DRV). It became the first former European colony to establish a popular democratic government after the war. At this independence celebration, the opening lines of Ho’s speech were taken from the U.S. Declaration of Independence. Americans were the only honored foreign guests, and Major Archimedes Patti of the OSS stood next to General Giap, the commander of the Viet Minh forces. Some Americans who were in Hanoi and Saigon during the war supported the Viet Minh struggle; they “warned of imminent cold war and recommended U.S. withdrawal from the area, [and] also argued against providing assistance to France for the purpose of returning to Vietnam.” The Truman administration ignored their recommendations. At the end of the Second World War, at this moment of independence, David Marr writes, millions of Vietnamese “knew they were making history, not just witnessing it. Many sensed that their lives were changing irrevocably.…” This historic Vietnamese struggle was to be blocked by U.S. allies Britain and France. In late September 1945, the British rearmed some fourteen hundred French soldiers and civilians who “in the name of restoring law and order,” rampaged through Saigon, “cursing, beating up, detaining, and otherwise offending any native encountered.” Vietnamese then retaliated by killing more than a hundred and fifty French civilians; many were women and children. Later that fall, British, French, and Japanese troops attacked the Viet Minh near Saigon. Let this historical fact sink in: Japanese troops, who a few months earlier were killing and wounding British and U.S. troops, now joined British forces trying to destroy Vietnamese resistance against the returning French colonialists. In early 1950, the Vietnamese resistance against the French was strengthened when the People’s Republic of China became the first nation to formally recognize the Democratic Republic of Vietnam. China sent American weapons and ammunition it had captured in Korea, and this allowed General Giap to arm new divisions in the fight against the French. Chinese aid later included anti-aircraft units that Giap used in the May 1954 victory over the French at the critical battle of Dien Bien Phu. During this period and into the early years of the American war, the Chinese “exerted considerable influence” over Vietnamese Communists until their own Cultural Revolution of the late 1960s. Relations worsened considerably after President Nixon’s 1972 visit to China, eventually leading to war in 1979 when the Chinese invaded Vietnam. President Jimmy Carter supported this invasion, urged on by his national security advisor, Zbigniew Brzezinski. Historian Michael Gillen contends that the United States missed an opportunity when its officials did not listen to OSS agents on the ground in Vietnam, such as Lt. Col. Peter Dewey, who wrote from Saigon in September 1945: “Cochinchina [southern Vietnam] is burning, the French and the British are finished here, and we [the Americans] ought to clear out of Southeast Asia.” Dewey became the first U.S. casualty of the war in Vietnam when he was killed by Viet Minh soldiers at a military checkpoint. At the time of this image the ship “Red Oak Victory” is the only operational Victory class ship in the world. Used extensively during World War II for transport of various goods it was a faster and longer range successor to the earlier Liberty class, with about the same capacity. The hull was recently refurbished and painted. Image 20 July 2013. Sailors from the USS Stamford Victory were among the few Americans to see the sight of “fully armed Japanese soldiers, several weeks after [Victory over Japan] Day, being employed by the British in Vietnam.” The crews of this and other U.S. ships witnessed the Vietnamese reaction. One sailor reported that they “all spoke to us of their hatred of the French and their wonder at the Americans [for] bringing the French invaders back.” These members of the National Maritime Union (NMU) protested “the policy of the United States Government in chartering ships, flying the American flag,” to transport French troops “in order to subjugate the native population of Vietnam.” In a stunning shift in history, U.S. vessels brought French troops to Vietnam so they could join recently released Japanese troops to support France’s attempt to crush the Vietnamese independence movement. The sailors’ action was the first organized antiwar protest against Washington’s policy, twenty years before campus protests began in 1965.